The past week, I've been doing searches on Proquest Dissertations &Theses Global. It's a massive database that "offers abstracts and indexing for approximately 4 million dissertations and theses, with full text (PDFs) for more than 2 million of those works." 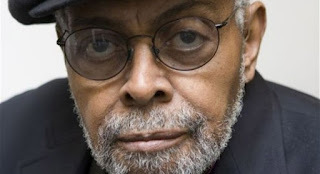 I've been thinking and writing about Amiri Baraka's works for years now, so he was one of the figures I decided to search for references to on ProQuest. How many people have referenced Baraka in their dissertations over the last 58 years--from 1960 when Baraka first emerged to 2018? According to the search results, Baraka (formerly known as LeRoi Jones*) has been referenced a total of 2,946 times. I wanted to take a look at different phases of his career. I decided on three time frames. From 1960 – 1976, Baraka was referenced 249 times in dissertations; his name appeared in 6 titles. From 1977 – 1999, Baraka was referenced 605 times in dissertations (10 in title). From 2000 – 2018, Baraka was referenced 2,092 times in dissertations (8 in title). It caught my attention that 71% of all Baraka mentions in dissertations occurred during the 21st century. I've done searches on dozens of African American poets and noticed that only Langston Hughes and Maya Angelou are referenced more than Baraka. "Black Arts Movement" and Baraka were mentioned 37 times in dissertations from 1960 - 1976 then 191 times from 1977 - 1999, and 896 times from 2000 - 2018 -- a signal that Baraka is frequently linked to that movement. However, Black Arts Movement is referenced only a total of 1,660 times, which suggests that Baraka is also cited well outside that specific context. * I searched for "LeRoi Jones" from 1960 - 1976, as Baraka was commonly referred to both during that time.